Beautiful tank! Thanks for sharing! Very nice tank! How many bulbs and what wattage are your T5's? It looks great! I'm running 6x39w T5HO. It's a TEK fixture with 2 ATI true actinic, 1 ATI Fiji purple, 1 ATI coral+, and 2 Geismann 6000k midday bulbs. 8 hour photoperiod. It's a little more yellow than you usually see these days, but the softies look great. Running this bulb combo has the added benefit of photographing exactly how it appears in real life! Awesome tank. Would love to have space for a tank like this. Thanks for the kind words everyone. 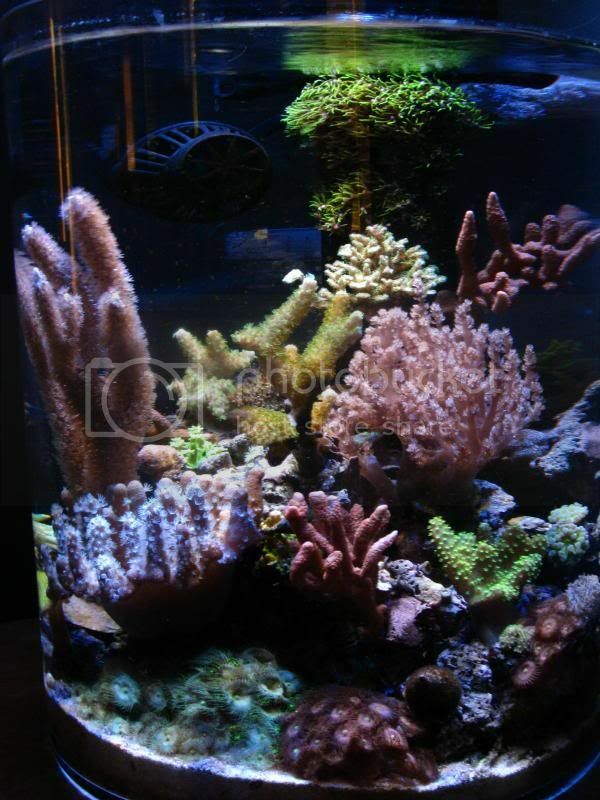 I love his tank, too-it's the reef tank I always wanted! That's a great looking tank you're using for your avatar. Do you have a link describing specifics or have any more pictures? As soon as I saw the title of this thread, I was hoping it was going to be your tank. I saw your tank in some other thread a while back. Definitely one of my favorite tanks of all time and am glad to see its doing well. I usually am a fan of the bluer look but I think the softies look really good under your bulb combo. Everything just looks healthy and thriving. I have a couple of questions if you dont mind. What happened to that huge ball shaped frogspawn you used to keep on the left? It looks like its still in your avatar pic? How often do you run carbon with a softie tank like yours? Do you get any shadow problems since the fixture your using is shorter than your tank length? I still can't believe you fragged up that huge frogspawn! Tank still looks amazing, but that frogspawn really set it apart, IMHO! Thanks, it wasn't an easy decision! I have much more room for my other colonies now though. The cool part of all this is that the frags (120+ heads!) sold for enough to finance a nice LED fixture for my tank. I've been wanting to try out LED for a while; we'll see how it goes-the softies really seem to like the T5's. 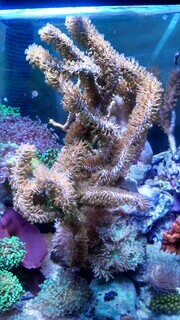 Which gorgonian do you have? I have a Grube's and a Corky Finger in there. I haven't seen too many Corky Finger Gorg's, if you have one I'd love to see it! Anyway, the ends of the tank are a little darker, but it's barely noticeable. I ran some PAR numbers a while back and the sandbed on the ends was around 75 while the middle of the tank was around 150.
here is a pick of my corky finger.. Awesome tank, nice and full! I am always so worried about the corals touching each other, which in part had led to my somewhat unique aquascaping. Thanks for sharing! Your tank is very healthy. What are the specifics? Alright, who's gonna frag their gorgs and send me a piece? I have a few different gorgs now, but none are as full as yours are! They look awesome! Here is my corky finger gorg. indestructible since 2005. Very nice. Ever cut a piece of him off? I was thinking about fragging mine soon. Nice job! I'm a softie fan as well and you did a nice job with making a natural looking lagoon aquascape. Is this tank still running? Got any update pics?